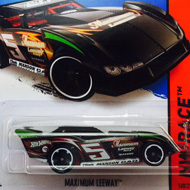 01/250 is part of the HW Off-Road series and the 2014 Treasure Hunt set. 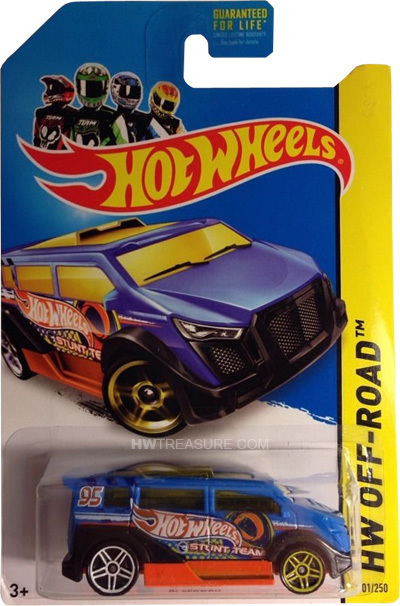 The van sports red, white & yellow graphics, “Hot Wheels Stunt Team”, “95”, and the low production symbol on the sides. It has yellow tinted windows, PR5 wheels with yellow spokes in the front and white spokes in the rear, and an orange plastic Malaysia base. 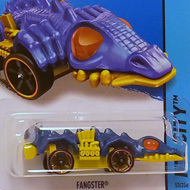 The Speedbox debuted as a rettungswagen (German for ambulance) in the 2013 HW City series. The vehicle’s most notable feature is its clear roof.